"Now, one way to open [safes] is to use dynamite. The system preferred by the famous fu Cimin....The poor guy got blown up with the safe. Therefore, I'm ruling out this method outright." Close on the heels of the classic crime thriller Rififi came this wacky satire on the hard-boiled professional crime movie. 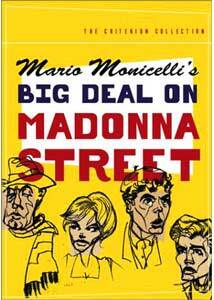 Where Rififi focused on men who were highly competent at their 'work' of burglary and safecracking, the participants in Big Deal on Madonna Street are uniformly inept and incompetent. The results are highly funny, even for those not familiar with the original. Small-time car thief Cosimo (Memmo Carotenuto) gets caught red-handed, and attempts to get one of his cronies, either Mario (Renato Salvatori), Ferribote (Tiberio Murgia), cameraless photographer Tiberio (Marcello Mastroianni) and Capanelle (Carlo Pisacane) to plead to the crime so he can take on a "big job" that he knows about. They eventually con glass-jawed boxer Peppe (Vittorio Gassman) into doing it, but he ends up getting arrested on his own account. When Cosimo confides the plan to Peppe, the boxer double-crosses him and on release takes over the job, and Cosimo's "gang", himself. The plan involves a thin wall between a vacant apartment on Madonna Street and the next-door pawnshop safe. The hapless gang makes their "scientific preparations" with the help of safecracker Dante Cruciani (Totò), ridiculously giving lessons on safecracking on a roof amongst the drying laundry. Of course, the plans end up a complete mess, the execution is flawed to say the least, and comic disaster stalks their every steps. Much of the comedy here is slapstick, but there is also plenty of verbal humor that comes across well through the newly-translated subtitles. The picture is probably funniest if viewed soon after Rififi, especially in the contrast between the accomplishment of the respective heists in each picture; where the gang in Rififi is utterly quiet, speaking not a word, the hapless group in Big Deal makes every noise imaginable and is constantly talking and fighting amongst themselves to humorous effect. Mastroianni is quietly amusing as the photographer trying to take care of his infant child while simultaneously taking part in the heist; he gives a nicely understated but still amusing performance. Vittorio Gassman is generally good, though a little broad in his facial expressions when he is inevitably knocked out (which happens repeatedly). The gem of the cast is Carlo Pisacane as the aged and dimwitted Capannelle. His slightly dotty and confused take on life makes him a subject of laughter whenever he has screen time. Claudia Cardinale, despite her high billing, is hardly visible here at all. Part of what makes the film so good is the poverty and desperation of the central characters, which heightens the pathetic nature of their attempts to strike it rich with a heist. This gives the comedy a grounding in seriousness and reality that makes the film all the more touching. The black and white photography is crisp and gorgeous throughout, making this a visual feast as well as a highly amusing divertment. The pacing is brisk and the swingy jazz score by Piero Umiliani propels things along at a breakneck speed, for highly enjoyable results. The intertitles (such as "One month later") are announced with trumpet fanfares that are so utterly out of place that one can't help but laugh at them. This is one of the better foreign comedies, enjoyable even for those who don't usually like such films and find alleged comedians like Tati boring (as I do). The main (and a very minor) detraction is the ghastly cover art; when will Criterion hire an actual artist to design their uniformly hideous DVD covers? Image Transfer Review: The original full-frame presentation is included here in a rich chiaroscuro. The blacks are incredibly deep and moody, as is the case in the model. While there are long stretches that are completely flawless, there is an abundance of speckling near the reel changes. However, the picture has nice crispness and clarity without a digital appearance or edge enhancement. There is a lot of grain, but that is due to the heavy use of low-light conditions, in clear mockery of the overuse of these techniques in Rififi. One look at the overly-contrasty and dupey trailer will make it clear just how excellent this picture looks. A very attractive video transfer. Audio Transfer Review: The only audio track is the original Italian mono. There is some minor hiss and noise, but it doesn't detract significantly from the presentation. As is typical for films of this age, low bass is completely missing. In some of the louder passages, the jazz score is slightly clipped and distorted. Overall, it's an adequate soundtrack. Extras Review: Other than a trailer for the U.S. arthouse release and some brief liner notes by Bruce Eder, there's nothing here. The subtitles appear to be well-translated and are removable. The layer change is badly placed in the middle of a fade; it could have been put two seconds sooner on a static intertitle and no one would have known it was there. A fun and rapid-moving satire of the safecracker heist genre, with some hilarious performances and a spiffy jazz score, given a nice transfer. Low on extras, it's still definitely worth owning.